Jocelyn Pook (left) and conductor Harvey Brough (right) during the recording sessions for Eyes Wide Shut. In the film The Wife, Glenn Close plays a woman who has silently stood in the shadow of her husband, a famous author played by Jonathan Pryce. For much of the film, her emotions are only undercurrents, expressed mostly by the score. 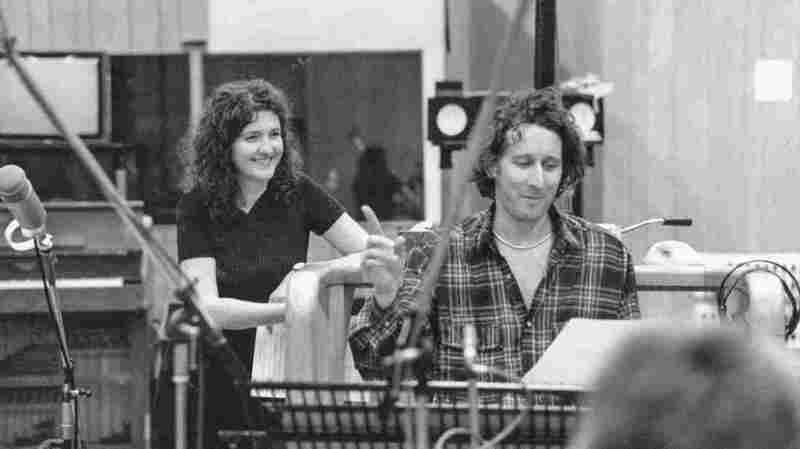 That music was written by Jocelyn Pook, an English composer who first came to international attention for her music to Stanley Kubrick's Eyes Wide Shut, particularly the music that soundtracks some of the film's weirdest scenes. Jocelyn Pook's weird started back in London, where she made up tunes as a kid. "My first song was called 'If a Man Was Dead Alone,'" Pook says with a laugh. "And we performed it at my local church." Pook went on to play viola in London pop bands and write music for theater and dance. A cassette landed in the hands of an ad agency, and music for a TV commercial led to a record deal. Her first album Flood was released in 1999. At the same time, choreographer Yolande Snaith was working on the masked ball scene in Kubrick's film and playing Pook's music during rehearsals. Kubrick was famous for his use of music, but he often preferred to use dead composers. Christiane Kubrick, says that's because her late husband needed to live with a piece of music for a long time before he knew it was right for a scene. "There wasn't the amount of time you want to let somebody write the music and then listen to it and say, 'No, I hate it. Do another one,'" Kubrick "There isn't simply the time to play with it. And so if he had found a piece on the radio or wherever, whether it was classical or modern, he said, 'Well, at least I know this one goes.'" But when Kubrick heard a piece Pook had originally written for a dance about homophobia, using a backwards sample of a Romanian priest, he knew he'd found the music for his masked cult scene. Then, he did something he rarely did — he asked Pook to write original music for several scenes. "And I tried not to freak out 'cause it was my first feature film," Pook says. "There was a big worry about giving me the video, and they were talking about somebody sitting in my house every day and taking it back 'cause, you know, there was so much secrecy around the Kubrick. But in the end they trusted me." Kubrick trusted her to score a pivotal monologue by Nicole Kidman's character in the film. When Eyes Wide Shut was released in theaters in 1999, many directors took notice of Pook's music. "But interestingly, more art house films," she says. "Not the Hollywood's kind of movies, in general ... The weirder ones." In 2004, Pook was hired by director Jean-Xavier de Lestrade to score The Staircase, a serial documentary about the death of a female executive in North Carolina and the murder trial of her husband. The film originally aired on the Sundance Channel, and recently resurfaced with new episodes on Netflix. Pook says her job was to play the emotional undercurrents of a real-life crime drama. "It was never about telling the audience what to think," she says. "And I think I'm generally not asked to do that. My music's usually used as another voice. And it's not usually used to underline what's happening, you know, in the scene." My music's usually used as another voice. That's exactly what Swedish director Bjorn Rünge wanted for The Wife, a film about the simmering emotions of a brilliant woman who's been muzzled most of her life. "I think her music is emotional in a very good way, and it's also not written on your nose," Rünge says. "It's complex music, and I like complexity. And it's not about bright music or sad music. I think Jocelyn's music has little bit of tone of melancholy." In a way, the music in all of these stories is connected. The Wife is about a woman forced to repress her emotions and accomplishments. The Staircase is about a successful woman who's now merely a silent corpse at the outset of a man's ordeal. And Eyes Wide Shut deals with the objectification and disposal of women. Jocelyn Pook expresses what all of these women can't. She feels their pain, too. "With every project I have to bleed," Pook says. "You know, you have to really feel like you're immersed in it, emotionally."